How Onrad Improves Referring Physician Relations - ONRAD, Inc.
At Onrad, we consider ourselves an extension of your organization. Whether we are assisting hospitals with on-site radiology coverage or teleradiology services, our level of commitment to overall success is always the same. In our minds, your hospital or radiology practice’s accomplishments are a reflection of Onrad, Inc. which is why we will be equally as dedicated to helping you achieve your goals for improving patient volume, quality, outcomes and patient satisfaction. The best way to grow patient volume and achieve success is to take steps to improve referring physician relations. We can help your organization grow your relationships in three key ways. Quality Control: Full quality control is made possible by our quality assurance program with expert, sub-specialized radiologists available for reviewing all reads, despite an average of <.02% chance of discrepancies. This will make referring physicians more confident in your radiology interpretations and help you earn their trust to treat more patients. Peer-to-Peer Review: We have radiologists on staff who are experts in every sub-specialty. This enables referring physicians to immediately consult with nationally recognized specialists, leaning on them for support despite their location. Quicker Turn Around Times: The average turn around time for radiology reports is generally advertised to be only 24 hours, but that is rarely the case, especially with other large teleradiology companies. Onrad, Inc. is one of the only teleradiology service providers to provide interpretations in under 30 minutes for STAT reports and non-STAT in under 24 hours. Everyone knows quick reports equals happy referring doctors. Providing the best quality care to your referring physicians’ patients is all about actually living up to the standards we have set for ourselves. At Onrad, we don’t just say we provide top-notch service; we actually deliver. 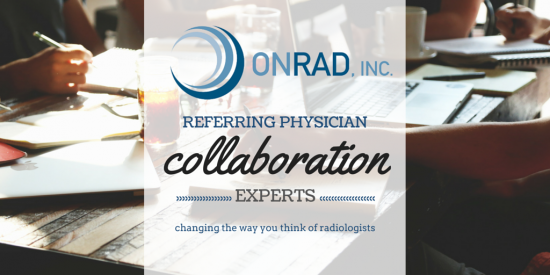 We dare to be different, which is what makes referring physicians so happy to work with Onrad radiologists.